Choose 1 or more color here. 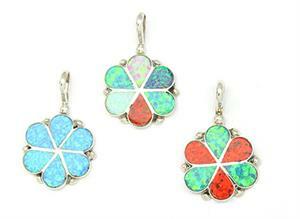 This sterling silver pendant is inlaid with multi-colored teardrop shape synthetic opal stones to form a flower with silver drops. It measures approximately 1" long with bail and just over 5/8" wide. Native handmade by Zuni artist Diana Shebola. Available in all lite blue, white/purple/green/red or multi color synthetic opal like pictured. Not pictured is one with 1/2 white opal and 1/2 red opal or one with purple opal and white opal alternating. Choose one or more color(s) when ordering.